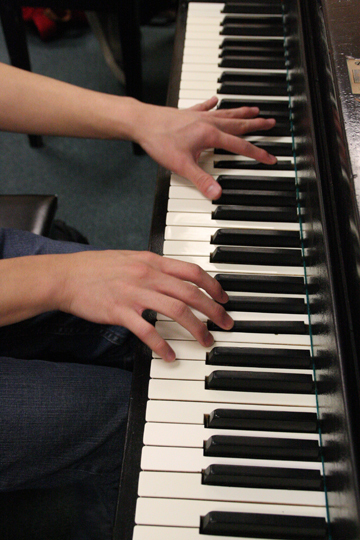 The Piano program emphasizes technique, understanding of period style, and interpretive skills in performance and ensemble playing. Students are evaluated and graded in coaching sessions, performance class, and recitals. The coursework includes solo, duo and chamber music literature at levels appropriate to student needs. Details on grading and expectations HERE. VOCAL ACCOMPANIMENT Participation in weekly labs with SOTA Vocal studying art song literature, culminating in performances every 6 weeks. THEORY Weekly classes with SOTA Vocal and Instrumental Music in written and aural (sight singing) theory and a range of levels of instruction in harmony, form & analysis, AP Theory, and composition classes. MUSIC HISTORY This is an important part of a musician's training and a requirement for all Instrumental Music students as well. This class meets on Mondays, from 2:10-3:10 pm, and is taught by Vocal Artist-in-Residence, Kristen Brown. Pianists who are not part of the Monday Vocal Lab are required to participate. IMPROVISATION Special workshops devoted to this area of study meet on an 8 week rotation in the Fall and Spring, on Fridays from 1:00-3:00 pm with Bay Area jazz pianist Randy Craig.